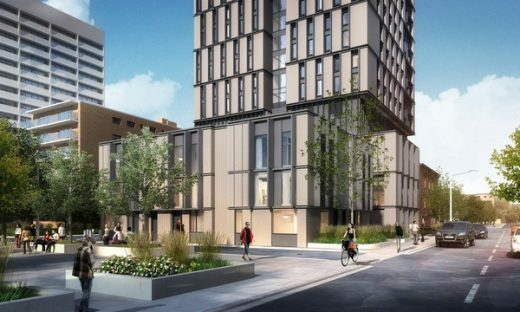 TORONTO – Diamond Schmitt Architects has won a design competition for the Environmental Science and Chemistry Building for University of Toronto Scarborough. This is the second building in a new campus precinct and is adjacent to the gateway Instructional Centre, also designed by the firm, which opened in 2011. The 110,000-square-foot facility provides innovative design solutions for sustainable and highly flexible research and study space. The building connects laboratories and academic offices around a skylit forum and crossroads. The architectural character of masonry and curtainwall extends an identity established by the Instructional Centre and both buildings serve to strengthen the pedestrian realm along Military Trail with transparent and visual connection to the street. “This project builds on our expertise in laboratory design to create a welcoming environment that is conducive to learning and scientific investigation,” said Donald Schmitt, Principal at Diamond Schmitt Architects. A modular design approach to the five floors of lab space ensures adaptability to the ever-changing nature of research and teaching methods while abundant natural light and an open concept configuration ensures clear sightlines. Thematically, this building is inspired by nature to reflect both the academic pursuits of environmental science and chemistry as well as its setting on the edge of ravine. Vertical sunshades of varying depths enliven the façade with an organic built form that relates to the visual effect of a wind pattern on sand. The building is targeting LEED Gold certification with sustainable features that include geothermal boreholes, an Earth Tube system to supply 100 percent fresh air to the administrative wing, unique fritted glazing to minimize solar heat gain, all LED lighting fixtures and a high performance curtainwall. 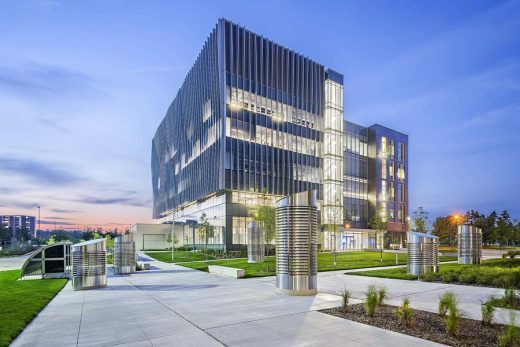 “The Environmental Science and Chemistry Building will be a landmark for academic excellence that will further strengthen UTSC’s rapidly growing campus and academic community,” added Schmitt. This technologically advanced building is being constructed on a fast track, Design Build contract in partnership with EllisDon. Groundbreaking for the $52.5 million facility takes place in early October and it is scheduled to open in July 2015. 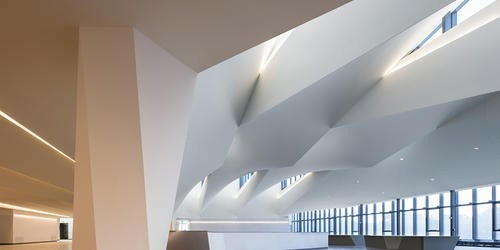 Diamond Schmitt Architects (www.dsai.ca) has extensive experience in both laboratory and academic facility design, in addition to commercial, residential, health care and cultural commissions. 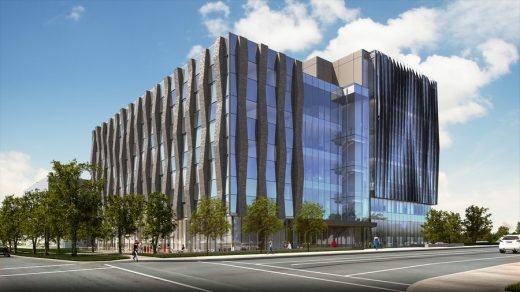 Current projects include The Hospital for Sick Children Peter Gilgan Centre for Research and Learning, Public Health Ontario Clinical and Research labs at MaRS Phase II in Toronto and the Global Innovation Centre at Wilfrid Laurier University.